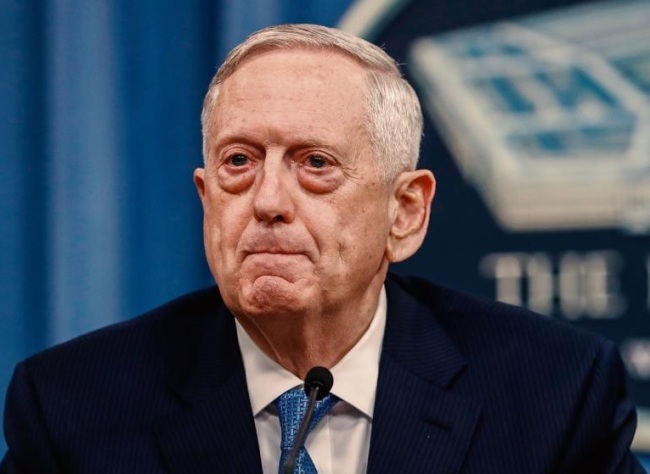 WASHINGTON -- US Defense Secretary Jim Mattis has called North Korea the most urgent threat to the United States as negotiations to dismantle the regime's nuclear weapons program have stalled. "In terms of urgency, North Korea is the problem," he said, according to a transcript released by the Pentagon. "We have got to address that, that issue. It's an urgent issue. That's why the United Nations has Security Council resolutions that are unanimous." The Security Council passed a series of sanctions resolutions last year to punish North Korea for its tests of intercontinental ballistic missiles and nuclear weapons. "How many times, ladies and gentlemen, do you see repeatedly China, France, the United Kingdom, Russia, the United States and more all voting with one voice?" Mattis said, referring to the permanent members of the UN Security Council. "Okay, so think what that says about the urgency of this issue in Korea." In terms of power, the defense secretary named Russia as the biggest threat, and in terms of will, China. US President Donald Trump has expressed a commitment to resolving the North Korean nuclear issue, saying over the weekend that he intends to have a second summit with North Korean leader Kim Jong-un in January or February. Their first historic summit in June yielded a commitment from Kim to work toward "complete" denuclearization of the Korean Peninsula in exchange for security guarantees from the US, but the two sides have since made little headway. Mattis said the effort to remove North Korea's nuclear weapons is "clearly in the diplomat's hands." "We have been able to actually reduce some of our exercises as a sincere measure, to say we want the diplomat to succeed," he said, referring to the suspension or scaling back of joint military exercises between South Korea and the US. "None of us thought this would be easy, that it would be automatic, that it would follow a script, so we're going to have to roll up our sleeves and keep at it," he added. The toughened sanctions have been a sticking point in negotiations between Washington and Pyongyang, with the North demanding relief and the US insisting that denuclearization be complete and verified before any provision of concessions. "Life is not good there," said Mattis. "Yes, they're trying little ways to work around them, but the bottom line is, if they want out from underneath the UN Security Council resolution sanctions, they're going to have to make progress."